We have all seen flyers posted around town for a lost cat or dog. Our hearts break as we can only imagine what the pet and their owners are going through. (Raleigh, NC area). Tracey’s passion is all about saving animals, through spay/neuter, adoption, pet recovery, etc.. Tracey is putting her training to good use. In each of our upcoming newsletter, we will feature a story of a lost pet that Tracey and her band of volunteers have recovered. Meet Tashi. Tashi a 2 year old Shih Tzu was lost at an Interstate rest stop while on a private transport going from VA to FL where his family was relocating to. When he was taken out for a bathroom break, he became frightened, and since he was not double-leashed was able to slip out of his collar and escape into the woods surrounding the rest stop. Many local community members, including the animal control helped search the first two days but weren’t able to find him. After day 2 of being lost, Tracey learned about Tashi through a friend tagging her on a FB post late that night. She was just resting up from capturing another lost pet who’s family was away on a European vacation, and had to be at work early the next morning. She visited the rest stop on a break from work on Day 3, and contacted the owner to get permission to enter the search, get details about Tashi’s personality and to get contact information so she could speak directly to the transport handler who Tashi had slipped away from. Two confirmed sightings later, one that day and one that evening, Tracey headed into the area early that next morning to start a search. She was driving down the road she thought he most likely would be near, and saw a man pulled off the road waving her down, asking if she was looking for a little white dog, if so, he’d just seen run into the woods. The man said thank you and left while Tracey set up camp and went to work using hot dogs and other smelly foods to entice him out of the dense woods. 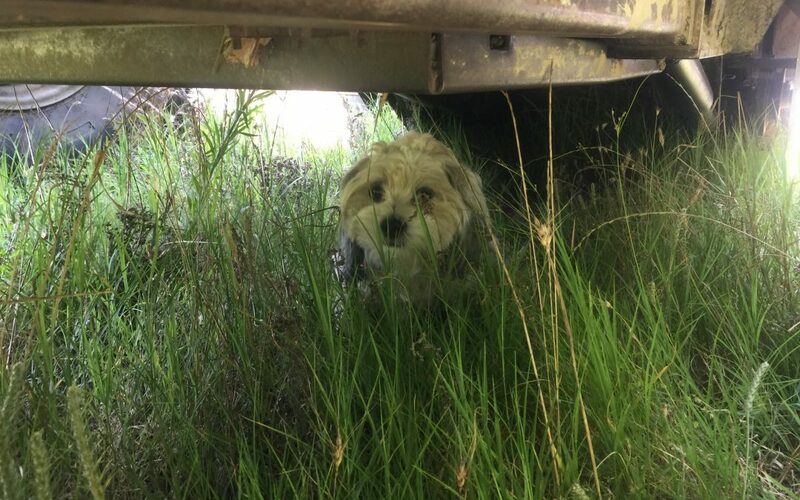 Just as Tashi was about to poke his head out of the trees, a loud truck approached and off Tashi went running down and across the road into a field, Tracey following behind, and several hours later she spotted him in the same field hiding under a piece of farm machinery. With singing, talking and the help of some fried chicken that a volunteer brought to her, Tracey was able to gain Tashi’s trust and get him to safety. He was a little dirty and ragged looking but in otherwise good shape. Tracey took a photo and called the family to confirm the identity of the little white dog nestled in her backseat. She wishes now she’d recorded the joy expressed in that call to share with others. It was right before the 4th of July, but the local groomer agreed to get Tashi in asap, and were also able to get a quick check up from a local veterinarian. So now smelling and looking great with some worm medication and extra yummy treats they headed to Tracey’s home, where it was decided Tashi would stay until he could safely be returned to his family. Nine days later, the transporter who took Tashi home, was instructed by the owners to “do whatever Tracey says”; as she’d requested a No Paws OnThe Ground transport; meaning he was not to be outside the vehicle at any time until arrival. The transporter was required to make provisions inside the vehicle for all his “care” during the long trip home, which they did as well as keeping both Tracey and the family updated each leg of the trip. If you ask Tracey what made this capture special, she’d tell you that seeing the video of his homecoming and knowing that a family could stop worrying now that a beloved pet was back where he belonged. And the extra, extra special part: In the nine days Tashi was in their care they became quite attached and Tracey and her husband are now referred to as Uncle Telly and Aunt Tracey. They look forward to the frequent updates and area making plans to visit Tashi and his family in FL next year. Tracey is grateful to be able to do this work and says reunions like Tashi’s make all the ant bites she got sitting in that field worth it! We all applaud Tracey for her hard work and commitment to finding lost cats and dogs. For more information about the Missing Animal Response Network and Kat Albrecht please visit her website at https://www.missinganimalresponse.com.